The Hollywood Reporter published the article 'Star Wars: The Force Awakens' Young Reader Graphic Novel To Be Published This Summer (Exclusive) on Tuesday that says IDW is publishing an 80-page young reader graphic novel in August. This graphic novel is being released before IDW's Star Wars Adventures comic book! Could this graphic novel be the graphic novel that was announced on the official Star Wars website back in the August 2016 article ReImaging a Saga: How Disney-Lucasfilm Press Made the Beautiful Star Wars: The Original Trilogy – A Graphic Novel? If not, this will be the third comic adaptation of the film! In celebration of Star Wars Day on May 4th, 2016 and to help promote their recent Star Wars trade paperbacks, Marvel released 10 comics under the True Believers brand for only $1. 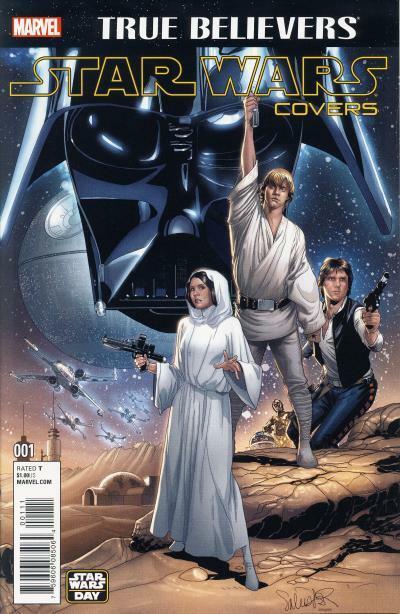 One of those $1 comics contains just Star Wars comic covers promoting the Star Wars: The Marvel Covers Volume 1 hardcover. Yes, Marvel released a hardcover containing all the variant covers for Star Wars #1 - 6, Darth Vader #1 - 6, and Princess Leia #1 - 5! The cover art used is the same as the Fan Expo Dallas exclusive cover. The Nordic countries of Denmark, Finland, Norway, and Sweden all had Marvel Star Wars comics translated into their native language between 1977 and 1983 in album or trade paperback format. Albums #1, 4, and 6 contain the Marvel movie adaptations. Albums #2, 3, and 5 contain other early Marvel stories arcs heavily edited. Denmark's Interpresse published the Danish translations of the album and Sweden's Semic Press published the translations for the other three Nordic countries. In Denmark, the first five albums use the Danish translation for Star Wars on the cover Stjerne Krigen. 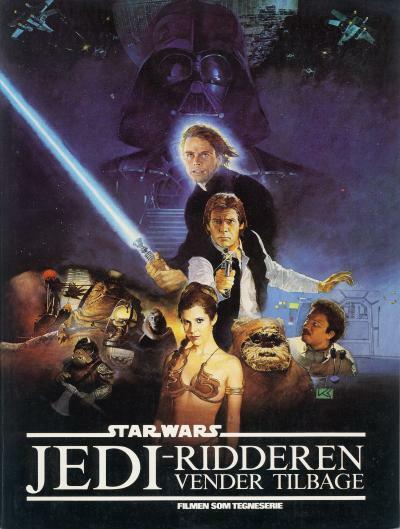 For the last album, only the Star Wars name is used, although Return of the Jedi is translation to Danish as Jedi-Ridderen Vender Tilbage. The Danish version of the album has a different cover than the other Nordic countries. 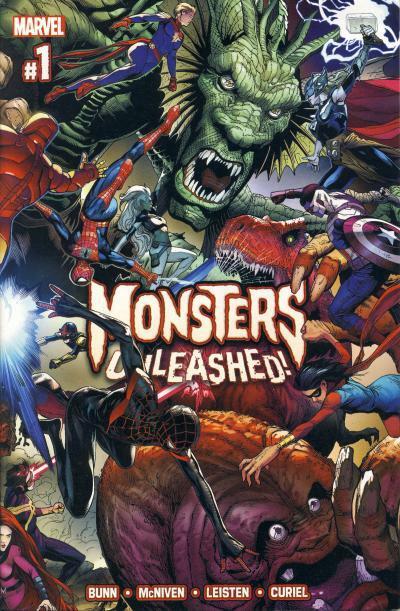 The other countries use the cover art found on Marvel Super Special #27. Denmark's version of the album uses the artwork found on the Return of the Jedi style "B" poster. 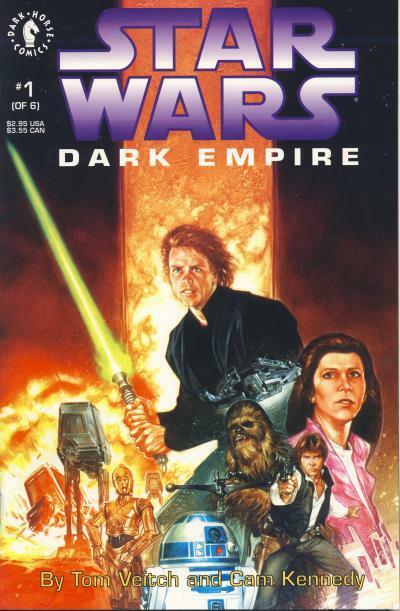 Interestingly, the image of Luke Skywalker on the cover should be familiar to Star Wars comic fans; Luke on the cover for Dark Empire #1 is similar to his image found on the 1983 poster. Contempt briefly filled her face. "You don't have the faintest idea who I am, do you?" Luke shook his head. "I'm sure I'd remember you if we'd met." "Oh, right, " she said sardonically. "The great, omniscient Jedi. See all, hear all, know all, understand all. No, we didn't actually meet; but I was there, if you'd bothered to notice me. I was a dancer at Jabba the Hutt's palace the day you came for Solo." Luke frowned at her. No. Her slim figure, her agility and grace - those certainly could belong to a professional dancer. But her piloting skills, her expert marksmanship, her inexplicable working knowledge of lightsabers - those most certainly did not. Mara was still waiting, daring him with her expression to figure it out. "You weren't a dancer, though," he told her. "that was only a cover." Her lip twisted. "Very good. That vaunted Jedi insight, no doubt. Keep going; you're doing so well. What was I really doing there?" No. Her knowledge of lightsabers... and suddenly, all the pieces fell together with a rush. "You were waiting for me," he said. "Vader knew I'd go there to try and rescue Han, and he sent you to capture me." "Vader?" She all but spat the name. "Don't make me laugh. Vader was a fool, and skating on the edge of treason along with it. My master sent me to Jabba's to kill you, not recruit you." Luke stared at her, an icy shiver running up his back. It couldn't be... but even as he gazed into that tortured face, he knew with sudden certainty that is was. "And your master," he said quietly, "was the Emperor." "Yes, " she said, her voice a snake's hiss. "And you destroyed him." Luke swallowed hard, the pounding of his own heart the only sound. He hadn't killed the Emperor- Darth Vader had done that - but Mara didn't seem inclined to worry over such subtleties. "You're wrong, though," he said. "He did try to recruit me." "Only because I failed," she ground out, her throat muscles tight. "And only when Vader had you standing right there in front of him. What, you don't think he knew Vader had offered to help you overthrow him?" Unconsciously, Luke flexed the fingers of his numbed artificial hand. Yes, Vader had indeed suggested such an alliance during their Cloud City duel. "I don't think it was a serious offer," he murmured. "The Emperor did," Mara said flatly. "He knew. And what he knew, I knew." Her eyes filled with distant pain. "I was his hand, Skywalker," she said, her voice remembering. "That's how I was known to his inner court: as the Emperor's Hand. I served him all over the galaxy, doing jobs the Imperial Fleet and stormtroopers couldn't handle. That was my one great talent, you see - I could hear his call from anywhere in the Empire, and report back to him the same way. I exposed traitors for him, brought down his enemies, helped him keep the kind of control over the mindless bureaucracies that he needed. I had prestige, and power, and respect." Slowly, her eyes came back from the past. "And you took it all away from me. If only for that, you deserve to die." "What went wrong?" Luke forced himself to ask. Her lip twisted. "Jabba wouldn't let me go with the execution party. That was it - pure and simple. I tried begging, cajoling, bargaining - I couldn't change his mind." That exchange between Mara Jade and Luke Skywalker in the Heir to the Empire novel explains Mara's intense hatred for Luke and obvious disdain for Darth Vader. She failed in her mission to kill Luke and, in doing so, her failure led to the death of her master at Luke and Vader's hands. In that moment, she was torn from the life she knew and all the comforts that came with her position as the Emperor's Hand. Her attempts to get Jabba to let her go to the Sarlacc Pitt is how the Dark Horse 6-part mini-series, Mara Jade - By the Emperor's Hand, begins. The Emperor, disappointed in Mara's failure to kill Luke, sends her on a new mission to kill the Jeodu Dequc, a criminal cartel leader attempting to revive Black Sun under the name Black Nebula. 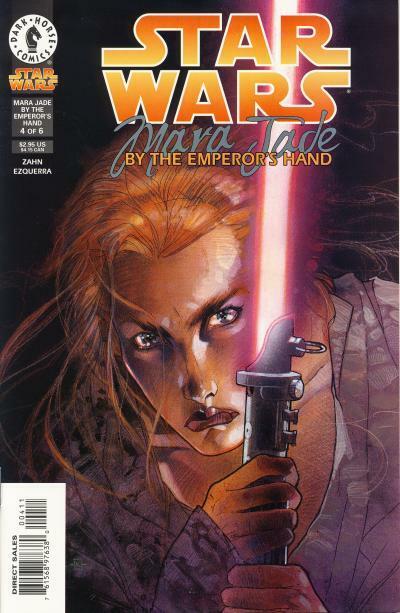 In the first issue, Mara Jade tracks down Dequc and early in the second issue, believes she kills him. The Emperor recalls Mara to Imperial Center as a reward. At Imperial Center, Mara decides to do more investigation into Black Nebula and soon learns it was not Dequc she killed, but an impostor. 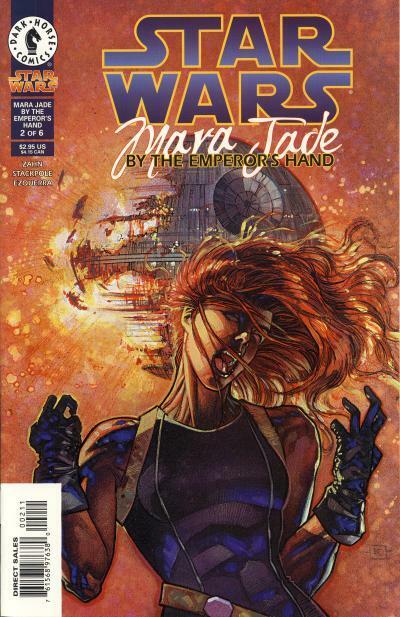 Mara contacts the Emperor to tell him of her failure and during the mental link, she sees Luke Skywalker and Darth Vader strike down her master over Endor. The rest of the mini-series is her running from the Imperials led by Ysanne Isard, directory of Imperial Intelligence, and getting a second chance to complete the Emperor's last mission for her, killing Dequc. The series ends with her having severed her ties with the Empire, but still completing her final mission, killing Dequc and ultimately bringing down the nascent Black Nebula criminal organization. 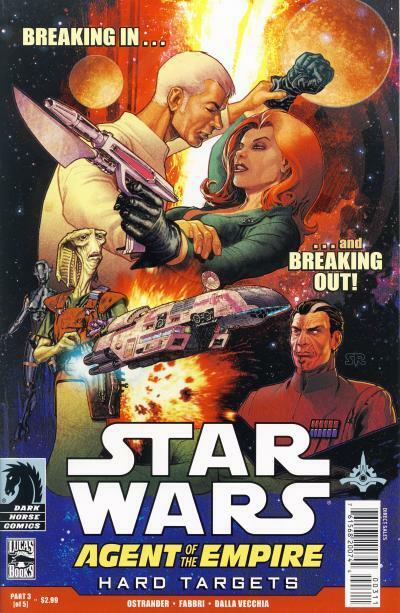 This series came out in 1998 and does a great job tying together many Expanded Universe elements. 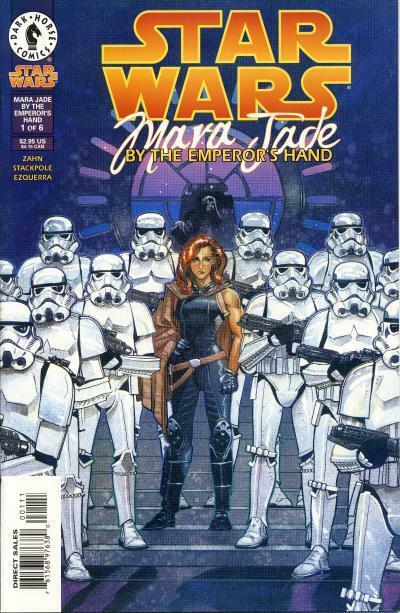 Mara Jade is introduced in Timothy Zahn's Heir to the Empire novel from 1991, the book that kicked off the Expanded Universe. Black Sun is the criminal organization led by Prince Xizor in the Shadows of the Empire multimedia event from 1996. Also introduced in 1996 is the Rogue's nemesis, Ysanne Isard, from Michael Stackpole's X-Wing: Rogue Squadron novels. Despite being integrally tied to the Expanded Universe, the writers, Zahn and Stackpole, do a terrific job using these elements, but not requiring readers to have a background in them. For reader's more steeped in Expanded Universe lore, seeing how this story fits into the tapestry is a bonus. Kilian Plunkett, cover artist for most of the 1994 and 1995 Droids' series provides the cover artwork for this mini-series. The Interior artwork is provided by Carlos Ezquerra, co-creator of Judge Dredd and Strontium Dog. The cover for issue #2 is particularly nice, showing Mara's reaction to the death of the Emperor. The action-packed explosiveness on the third cover makes it my favorite. The interior artwork by Ezquerra is interesting for a Star Wars comic. His style is gritty and his human characters are distinct. Where Ezquerra really shines is when he is drawing aliens, cities, and spaceships. It is easy to see why many consider him the quintessential Judge Dredd artist, despite the number of strong artist who have worked on that character. The Phantom Menace was released to theaters in May 1999. In the movie, Darth Maul, a Sith apprentice, is killed by Jedi apprentice Obi-Wan Kenobi after Maul strikes down Kenobi's master, Jedi Knight Qui-Gon Jinn, in a lightsaber duel. While Maul has a large presence in the movie chasing Queen Amidala and her entourage, he only speaks three lines. Darth Maul was presumed dead by fans for almost 13 years before he was revived for The Clone Wars animated series in March 2012. In the second to the last episode titled Brothers, Savage Opress finds his insane brother Maul, now using cybernetic legs, on a junk planet. Maul is not the first fan favorite character to be brought back from the dead however, Boba Fett is resurrected after being thrown into the Sarlacc Pit. Interestingly, in The Empire Strikes Back, Boba Fett only speaks four lines! Dark Horse published three 4-issue mini-series featuring Darth Maul as well as two single issue stories which were printed long before Maul was brought back in canon. One single issue story, Resurrection, is told in Star Wars Tales #9 and features Darth Maul battling Darth Vader. The other story in the Visionaries trade paperback, Old Wounds, has a living Maul, also with bionic legs, seeking revenge against his old adversary Obi-Wan on Tatooine. This last short story is the basis for a third season episode of the Rebels animated series which shows the final demise of Maul at the hands of Obi-Wan. Marvel is currently publishing a 5-issue mini-series starring Darth Maul. The first issue came out in February 2017 and so far the story is shaping up to being one of Marvel's better Star Wars stories. My favorite cover for the first issue is the Mark Brooks variant which was initially distributed in a 1:50 ratio. 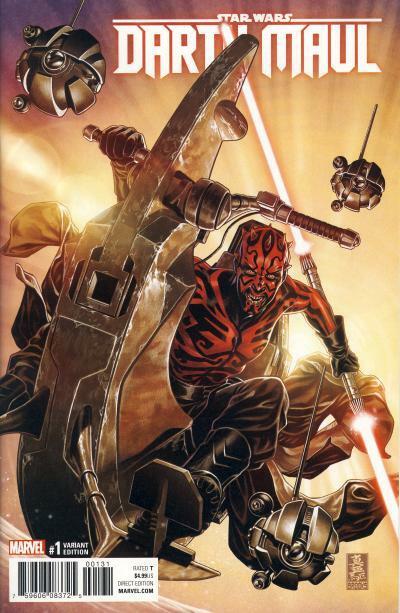 The cover artwork shows a shirtless Darth Maul sitting on his speeder bike surrounded by his probe droids. One cannot help but think he is enjoying himself while chasing prey he intends to kill with his double-sided lightsaber. The art is dynamic and visually appealing; it is easily one of Marvel's more memorable covers. Comichron released the May 2017 estimated sales this week. The best selling books on Diamond's Top 300 chart are all DC and Marvel superhero event books. Despite placing 12th on the chart, Star Wars remains Marvel's best selling ongoing title. When the Vader Down event came out in November 2015, it had a decent impact on the sales of the Star Wars and Darth Vader crossover issues. Star Wars #13 saw an increase in estimated units sold of 13.63% and Darth Vader #13 saw an even larger increase of 25.95%. In comparison, the Screaming Citadel event saw Star Wars #31 increase unit sales by only 1.04% and Doctor Aphra #7 by a modest 8.17% or approximately 3,300 units. I expected the Screaming Citadel event to perform closer to Vader Down percentage wise and Marvel has to be disappointed it did not even come close. Vader Down #1 placed 2nd for units sold in November 2015 and was the top selling Star Wars title that month with an estimated 384,969 units. It might be an unfair comparison, but you know Marvel was hoping for a repeat of Vader Down when they devised this event. Poe Dameron shipped two issues in May and issue #14 did not see any significant change in units sold from the previous month. Poe Dameron #15 however saw a large drop of 11.85% or nearly 4,400 units. This issue is now the lowest selling issue in an ongoing Star Wars title, taking the place of Kanan #12 which had estimated sales of 36,649 units. Unfortunately, the numbers for Rogue One #2 are equally disappointing. The 2nd issue of the Force Awakens only saw a drop in unit sales of 37.93% and its 1st issue had just under 15,000 more units than Rogue One #1. Rogue One fell 50.45% which is not terribly bad for a mini-series, but in comparison to The Force Awakens it is surprising. Rogue One #2 is now the lowest selling issue in a mini-series Star Wars title. Next month, the Darth Maul mini-series returns and we get the debut of Darth Vader's second series! The average sale per issue of 47,560 would rank 30th on the top 300 chart for the month of May. Star Wars trade paperbacks, reprint titles, and reorders are not accounted for with these numbers. The Star Wars trade paperbacks are strong sellers. Take a look at the Star Wars Sales Estimate Chart and please read the blog posting May 2017 comics sales estimates online; combining orders again gives Batman top slot. Star Wars #12 is the second chapter in the Dragon Lords story arc. 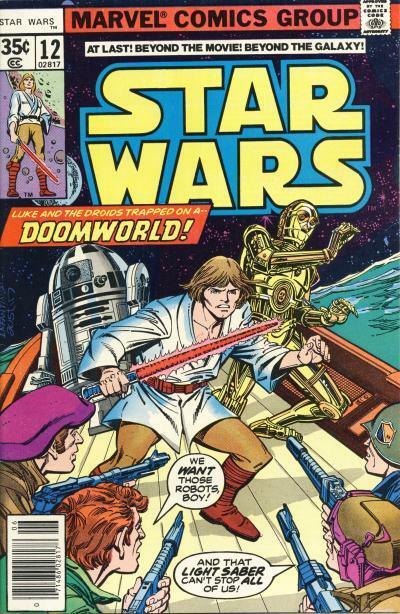 The issue starts with Luke Skywalker, C-3PO, and R2-D2, in an escape pod floating in an ocean, watching as two sea-dragons, led by a Dragon Lord, are salvaging their sinking spaceship. Three of Governor Quarg's water skimmers approach and a battle between the Dragon Lord and Quarg's men takes place. Two of the skimmers are destroyed but the wounded sea-dragons and the Dragon Lord retreat. Quarg's men capture Luke and the two droids and take them to their floating base. Governor Quarg is upset about the loss of the two skimmers, but decides to spare the men's lives as they explain they have something better, two droids. Quarg orders the droids dismantled for parts, but Luke convinces him the droids are worth more whole. Meanwhile, a tenuous partnership between Han Solo and Crimson Jack sees Han navigating Jack's Star Destroyer to the Drexel system. Han knows from Leia that Luke's last report had him in that system and Han convinced Jack the Rebel Treasury is there. Chewbacca, guarded by a pair of Jack's men, is aboard the Millennium Falcon docked in the Star Destroyer, presumably uploading star charts to the larger ship. (We find out in a later issue that Chewbacca is actually erasing the star charts from the Star Destroyer.) The Star Destroyer drops out of hyperspace into the Drexel system with the one water covered planet. Crimson Jack is suspicious and pulls his gun on Han wanting an explanation. 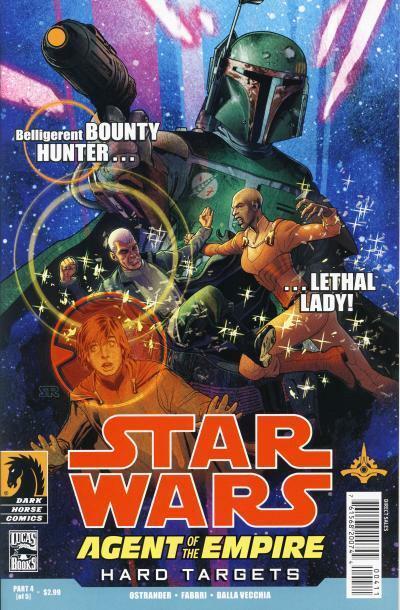 The cover artwork for Star Wars #12 shows Luke brandishing his lightsaber as Quarg's men demand Luke hands over the droids. C-3PO and R2-D2 are cowering in the background. The lightsaber is very short and the wrong red color. Luke was given his father's blue lightsaber by Obi-Wan Kenobi in the movie. 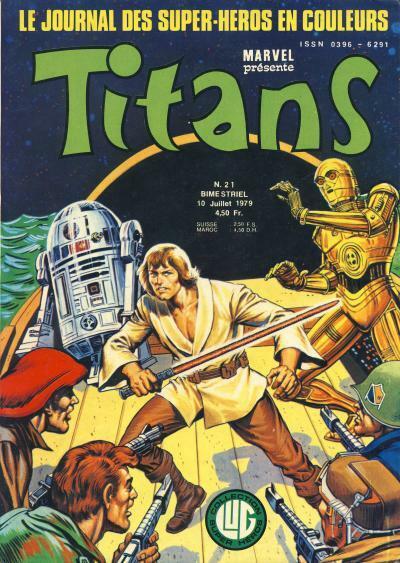 The cover for Titans #21 shows the same scene with everyone aboard the skimmer with the same poses, except Luke and C-3PO are facing the other direction. Luke is drawn smaller and his lightsaber, still incorrectly colored red, is much longer. Since both covers are nearly identical, it is hard to say which is better. I like the larger Luke on the U.S. cover, but the French cover is painted. Overall, the scene does a good job of showing the predicament that Luke and the droids are in. Happy Father's Day! To celebrate the day, I thought I'd bring you a cover featuring every Star Wars fan's favorite dad, Darth Vader. 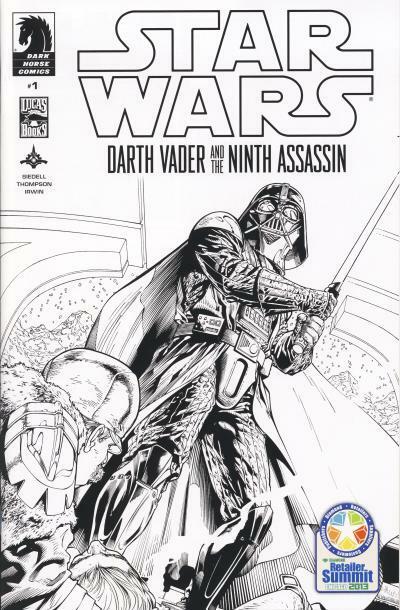 Joe Quesada has only contributed a handful of covers to the Star Wars line including one for the final issue of Marvel's 2015 Darth Vader title. This incentive variant was offered initially in a 1:100 ratio. The artwork is not as nice as Joe Quesada's cover for The Force Awakens #1 which does a wonderful job of showing Rey on Jakku, but it is definitely better than the artwork he provided for Star Wars #1. 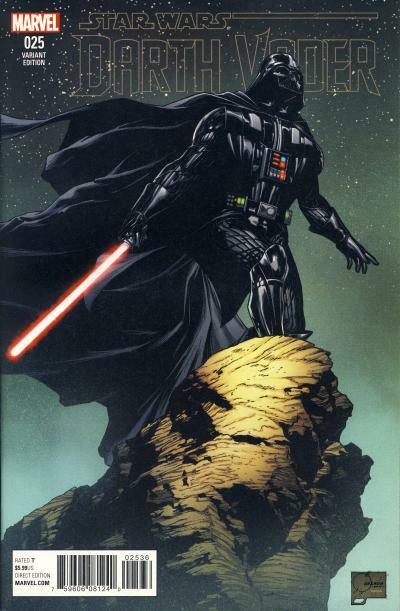 The drawing is Darth Vader standing on an outcrop clenching his lightsaber while peering up at the sky. The pose looks very much like a Batman pose; imagine the rock replaced with a rooftop ledge in the city and the lightsaber replaced by a batarang. While the artwork is decent, it does not stand out from the myriad of other Vader cover's Marvel has released since reacquiring the license. 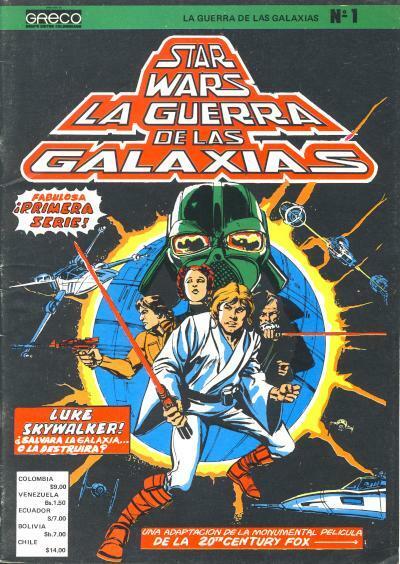 When the Clásicos del Cine or Film Classics title ended with issue #315, the Spanish translation of the Marvel Star Wars issues moved to another Editorial Novaro title, Domingos Alegres or Happy Sundays. 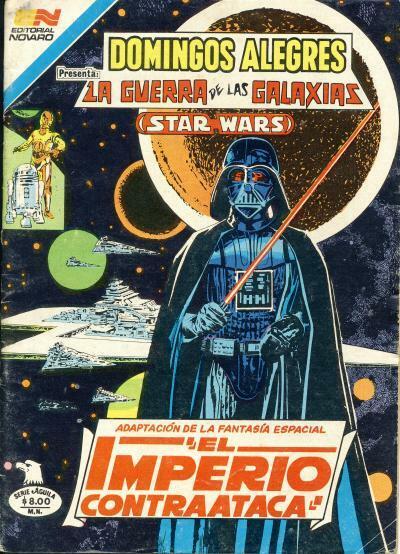 There are nine issues of Domingos Alegres with Star Wars published from December 1981 to August 1982. 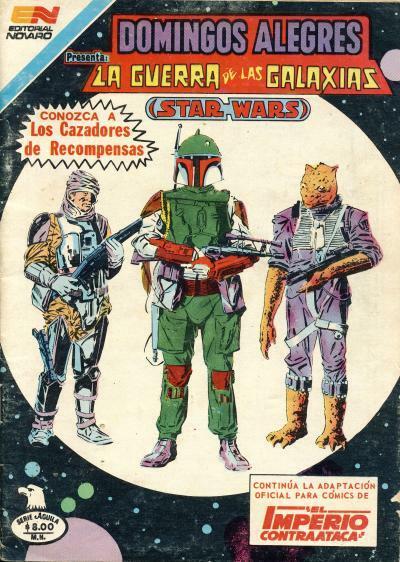 Domingos Alegres was a weekly book and Star Wars alternated with other comic titles. 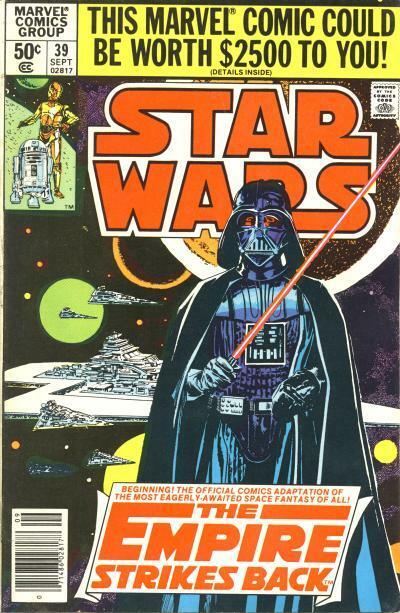 The Star Wars issue was followed by a Gold Key horror issue, a Charlton Beatle Bailey issue, and a DC Warlord issue and this repeated until the title ended with issue #1457. Every Star Wars issue in this title is in the aguila or eagle format which is a digest-sized comic although not nearly as thick. This is the same format used for the Star Wars adaptation that appeared in Clásicos del Cine #299 - 302. Like the first movie's adaptation, The Empire Strikes Back translation was published for Mexican readers in four issues: Domingos Alegres #1439, 1443, 1447, and 1451. Domingos Alegres #1439 uses the same cover artwork as Star Wars #39. Domingos Alegres #1443 uses the same cover artwork as Star Wars #41. 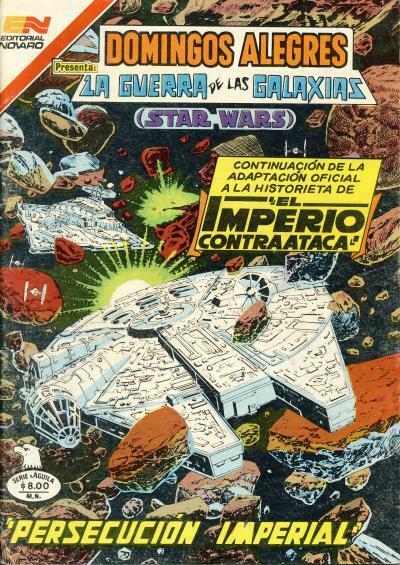 Star Wars #42's cover artwork is used for Domingos Alegres #1447. Like Star Wars #42, this issue commands a premium over the other issues in the adaptation. 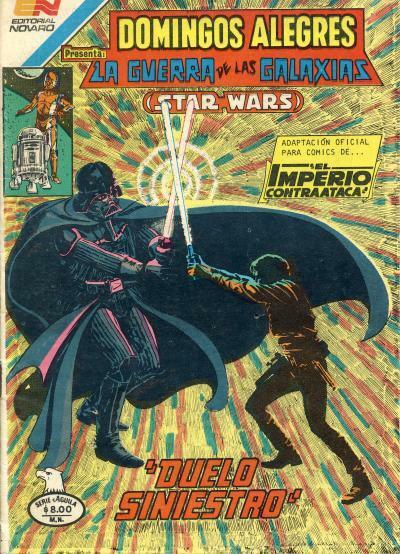 The final issue in the adaptation, Domingos Alegres #1451, uses the same cover artwork as Star Wars #44. It is generally known by gamers that video games based on movies tend to not be good. I suspect licensing costs which eat into the development money and a tight deadline to develop these games are the reason they tend to be bad. Most are clearly a money grab by the movie studio and the video game companies; they know the big-box stores like Target and Walmart will stock them on the shelves at the front of the store where they no doubt sell well for hit movies. The Revenge of the Sith video game by LucasArts and Ubisoft was released a few weeks before the movie in May 2005. Different retailers had an exclusive that came with the purchase of the game and Target's was a mini-comic bundled inside the the Xbox version of the video game. 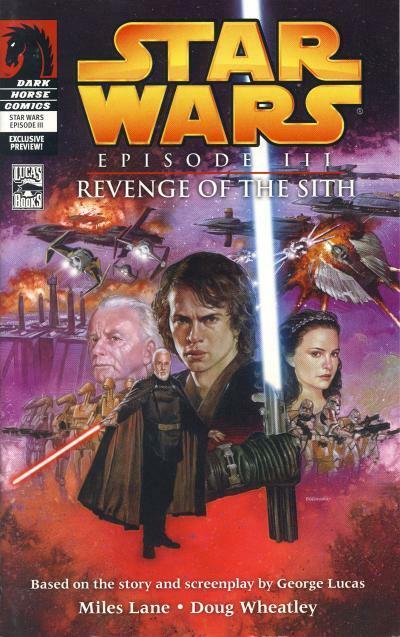 The cover artwork for the mini-comic is the same art used on the first issue of the 4-part Revenge of the Sith mini-series. The cheapest way to acquire the mini-comic is to buy the video game with the comic. Be careful and do not assume anything when purchasing the video game used or new. It is always a good idea to verify that the comic is included. I have several fun news items for you today. First, we just received our latest Mile High Comics insert poster from our printer. It features all 41 of our exclusive Marvel Comics STAR WARS variant editions that we have published over the past 2 1/2 years. We have published several incarnations of some of these variant covers for you as a part of previous Mile High Comics posters, but this time I decided that we needed to expand to a much larger size, as the cover images became so small as to be almost unrecognizable in our previous tri-fold format. In this much larger 22" X 36" format, however, I think that the cover images turned out really well. In case you are wondering, everyone who places an order with us over the next 30 days will receive one of these cool posters included in their package, for free! Posters will also be included in all of our N.I.C.E. subscription club packages for a month. All of these free posters will be folded several times, however, so they will need to be flattened upon arrival. If you would like a mint copy mailed to you in a tube, we have a few available at $9.95, which includes shipping and handling. 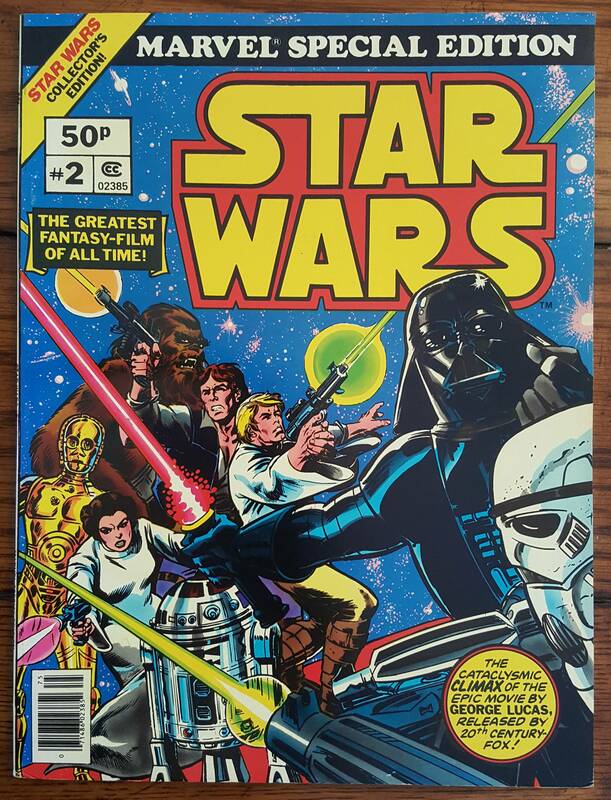 My favorite part about the poster is the blurb The Rarest Star Wars Comics Set in the World! Rarest? The covers, discounting the original six and those by Katie Cook, are pretty nice if not a tad expensive, but this set doesn't even crack the top 25 rarest Star Wars comics sets in the world. 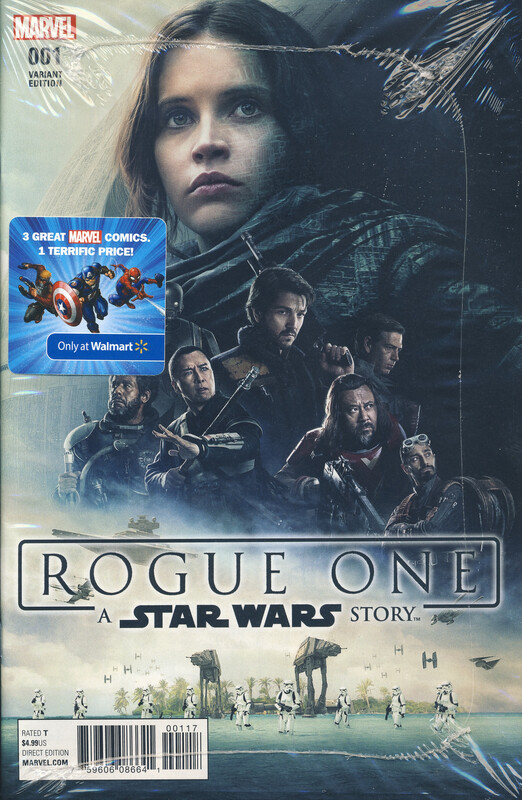 The Rogue One #1 Walmart exclusive cover is one of several movie posters released for the movie. 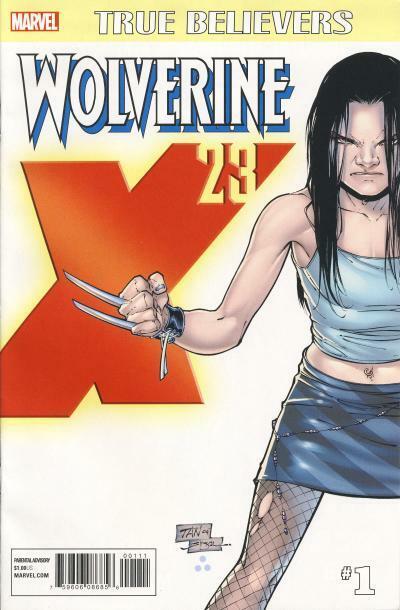 The other two comics in the 3-pack are True Believers - Wolverine X-23 #1 and Monsters Unleashed #1. I purchased 2 of these 3-packs with the Rogue One #1 exclusive at a non-Supercenter Walmart and both contained the same comics. There have been eBay sales of these 3-packs for $25 - $60 and listings in the same price range. I believe $60 is going to prove to be a high price to pay for this 3-pack. There are 3,946 Walmarts in the U.S. 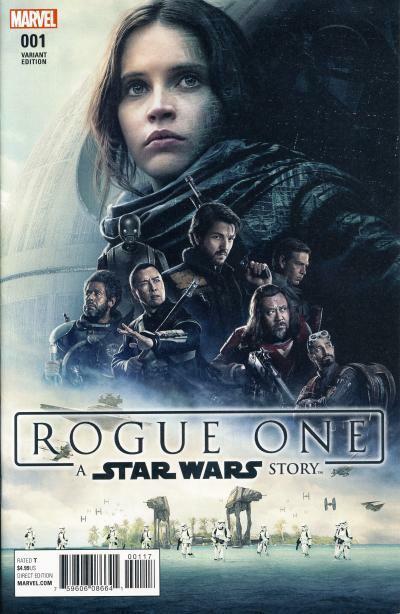 If each store receives only one case and there are only two of these Rogue One 3-packs in the case (I don't know how many come in a case, but I do know it is at least two) that would mean there are just under 8,000 units and that is an estimate on the low end. And you have to figure some stores, like the Supercenters, will receive more than one case. Some of these packs will be sold to non-comic collector, but I still believe the asking prices on eBay will fall once more of these show up a retail. Many people believe Doctor Doom was the inspiration for the character Darth Vader. Anakin Skywalker lost his mother, Shmi Skywalker, at a young age and that loss was instrumental in shaping the person he became, just like Victor Von Doom's loss of his gypsy mother, Cynthia Von Doom. Anakin used his intellect to fix machinery and Victor used his intellect to invent gadgets. Both became disfigured and have a person they blame; Vader rightfully blames Obi-Wan Kenobi and Doom wrongly blames Reed Richards. The disfigurement for both pushed them toward villainy and both wear a suit of armor that covers them from head to toe. Vader is a dark side user of the Force and Doom uses sorcery. Doctor Doom is a main villain in the Marvel Universe, ruling the country of Latveria, and Darth Vader is a main villain in the Star Wars Universe, commanding the might of the Imperial military. Mark Brooks drew a variant cover for Darth Vader (2017) #1 that pays homage to Uncanny X-Men #145. On the X-Men cover, Doctor Doom is holding an unconscious Storm, while her fellow X-Men lay defeated at his feet. The Darth Vader cover has him holding an unconscious Padme, while fallen Clone Troopers are scattered around the room. 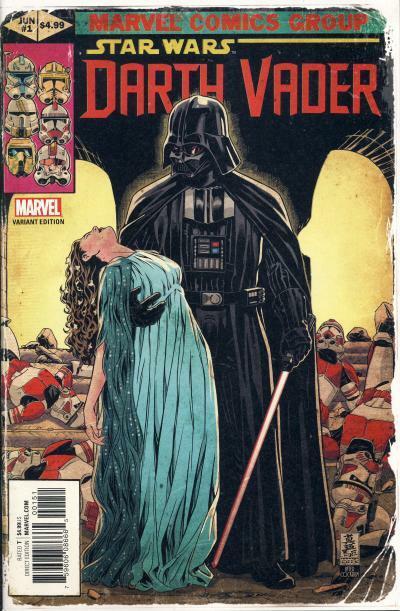 As an additional touch, the Vader cover has the branding of a Marvel comic from the early 1980s and is made to look worn like it was from that era. This comic was initially distributed in a 1:50 ratio. This week, Marvel has shipped the first issue of their second Darth Vader title. The previous Darth Vader title took place concurrently with the stories being told in the main Star Wars title; this new title begins with Darth Vader freeing himself from the medical table he was on when his body was first encased in armor as shown in Revenge of the Sith. 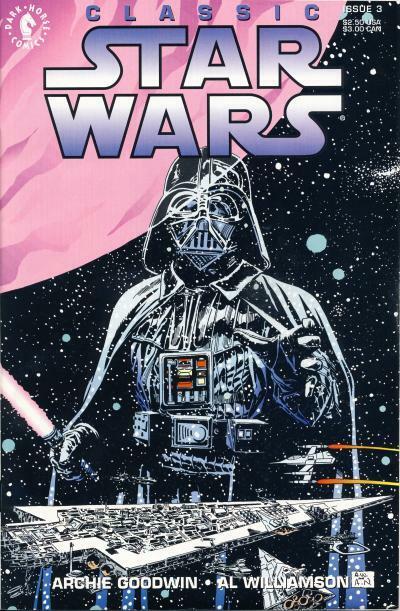 When Dark Horse held the Star Wars comic license, they also published titles featuring Darth Vader, including a series of one-shots then several mini-series. There were three one-shots which focused on Darth Vader hunting down and killing Jedi under the Star Wars: Purge title. These one-shots were followed by two 4-issue mini-series Darth Vader and the Lost Command and Darth Vader and the Ghost Prison. 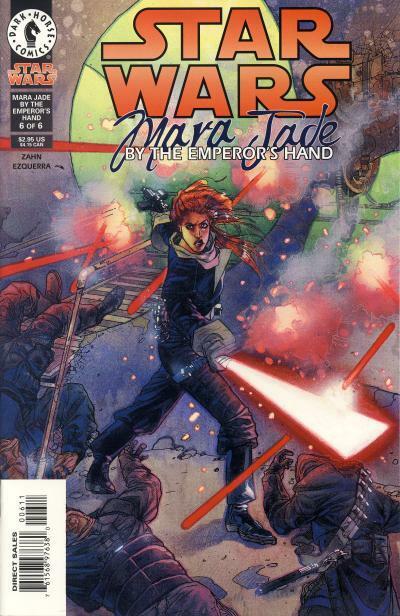 A final Purge story arc, the Tyrant's Fist, was a 2-issue mini-series published between the second and third Darth Vader title. The third and fourth Darth Vader mini-series were Darth Vader and the Ninth Assassin and Darth Vader and the Cry of Shadows. 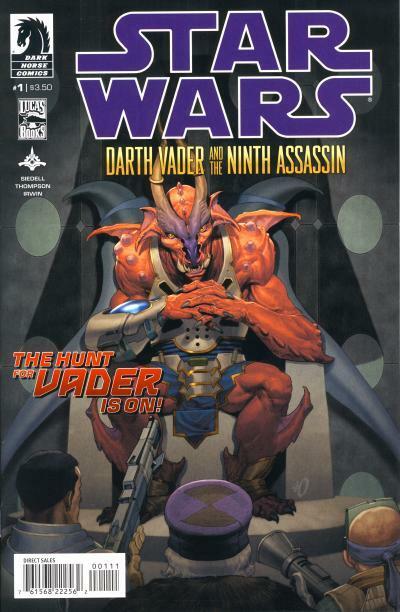 When the final Darth Vader mini-series was published, it was already known that the comic license was reverting to Marvel. Darth Vader and the Ninth Assassin #1 has two covers, a standard cover and a Diamond Retailer exclusive. 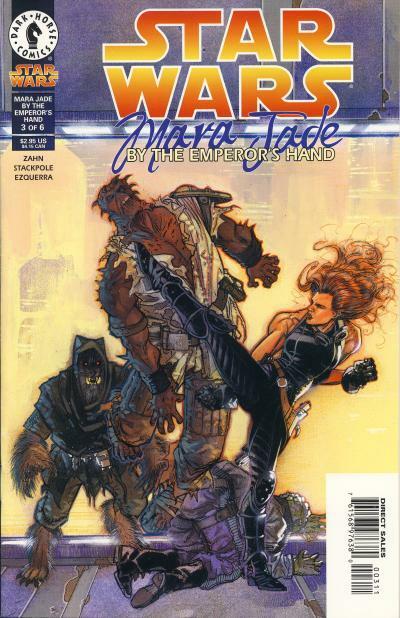 The standard cover shows an associate of the ninth assassin. Both the ninth assassin and his associate are unnamed in the story. An exclusive cover was given to retailers at the 2013 Diamond Retailer Summit in Chicago, Illinois from April 24 - 26. The artwork is a black and white version of a page from inside the story. The drawing shows Darth Vader after he kills the son of a rich mining industrialist. Both the industrialist and his son are also unnamed. It is the death of his son that prompts the industrialist to hire assassins to kill Darth Vader. The first eight fail before he seeks out and hires the ninth assassin. Star Wars: Agent of the Empire - Hard Targets is a 5-part mini-series that again focuses on Jahan Cross, an agent for Imperial Intelligence. The story starts with Cross in a brief battle with Boba Fett. Then the story jumps 10 days earlier, to an event celebration on Alderaan attended by Cross. On Alderaan, we meet Count Dooku of Sereeno (a decendent of the Count Dooku from the prequels), his son Bron, and the count's security head Candra Tymon who are also attending the celebration. Bail Organa is trying to recruit the Count, Adan Dooku, into the Rebellion, but Dooku resists. Count Dooku is killed by Jahan Cross dressed as a Mandalorian. A few days later, back on Coruscant, Cross and Ysanne Isard exchange words and Cross learns that someone on Serenno paid to have Count Dooku killed. He is assigned to protect Bron and ensure the Empire's pick for regent of Serenno is appointed since Bron is too young to rule. The regent is to be chosen from the six ruling houses of Serenno and Jahan's father, Davim Cross, is the Imperial Diplomatic Special Envoy overseeing the appointment. The Empire's choice for regent is Lord Rodas Borgin an unpleasant and unkind man. Davim Cross decides to confine the lords of the six houses on a wind craft so they can work out who the next regent will be. Bron and his bodyguard, Tymon, are also aboard. The wind craft is attacked by Vex, a former acquaintance of Cross's, and her band of pirates and she kidnaps Bron. Cross gives chase and catches her at a spaceport. She is taken into custody by the local security forces and take to a prison facility called The Spike. Cross breaks Vex out of prison and she tells him Lord Rodas Borgin arranged the kidnapping. Cross confronts Borgin who does not hide he was behind the kidnapping and later, Cross learns he is being recalled from the mission at Borgin's request. Cross knows Borgin is not in the Empire's best interests and enlists Tymon and his father to help him. Cross and Tymon travel to Otoh Dooku, Borgin's underwater sanctuary, to rescue Bron. They are chased by Borgin's security, but manage to escape. Boba Fett shows up to kidnap Bron. Borgin's security team confronts the group and Cross and Fett succeed in subduing the attackers while Tymon and Bron escape. Fett has a brief encounter with Cross repeating the scene that started this 5-part mini-series and then chases after Tymon and Bron. At a spaceport, Tymon launches in a shuttle as Cross catches up to Fett and in another brief skirmish Fett accidentally destroys the shuttle. It turns out it was all a ruse which Cross reveals to Borgin. Fett kills Borgin, thinking he was setup, and we learn that Bron was sent to Alderaan by Davim Cross to be raised in hiding and Tymon was alone aboard the shuttle that was destroyed. The Empire chooses another house's leader to be the Count of Serenno, one with less ambition and able to be manipulated by the Empire. The story is packed with the usual twists and turns you would expect of a spy thriller. Characters come and go and paying attention to the details is important in a dense story of this nature. Jahan Cross proves to be a more nuanced character in this, his second and final story arc, than in his inaugural story. In the tale, he does not blindly follow orders, but instead does what is best for the Empire. He recognizes Lord Rodas Borgin is a bad choice and he is able to manipulate events saving Bron and guaranteeing a better leader for the Empire is installed as the new Count of Serenno. 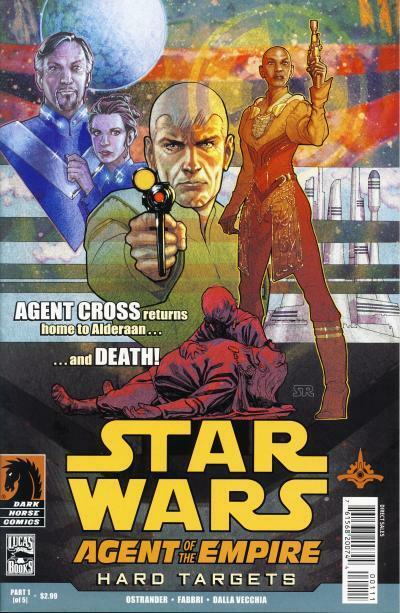 The cover for issue #1 shows Jahan Cross in the middle with Bron Dooku holding his father's dead body while Candra Tymon stands ready. In the background are Bail Organa and Princess Leia who make brief appearances in the story. For issue #2, the cover shows Vex in the foreground. Also shown are agent Cross, Lord Rodas Borgin, and his head of security, the Kahtooinian Hovus Jorrick. Darth Vader is in the background. Vader makes a brief appearance in the story as the man responsible for the Cleansing of Serenno, an event that saw the sons of the six houses kill their fathers and assume leadership of those houses. Cross and Vex are shown on the cover for issue #3 along with Imperial Intelligence scientist Alessi Quon and Director of Imperial Intelligence, Armand Isard. The robot next to Quon is IL-SA, made to look like IN-GA from the first mini-series. 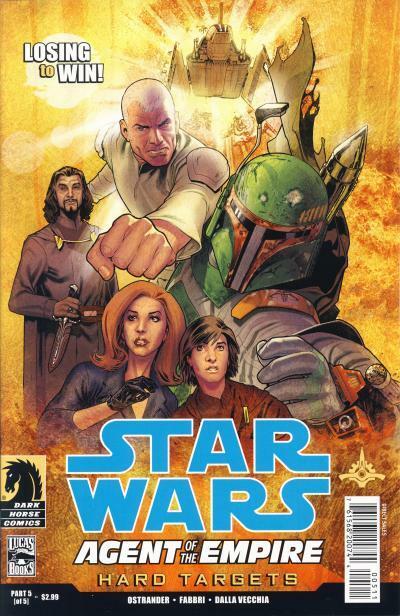 Cross, Tymon, and Bron are the focus of the cover for issue #4 with Boba Fett in the background. The cover for issue #5 shows Cross punching Boba Fett as well as Borgin, Vex, and Bron. Vex never actually appears in the issue, but the artist can be forgiven for this mistake since so many characters are used throughout this spy thriller. 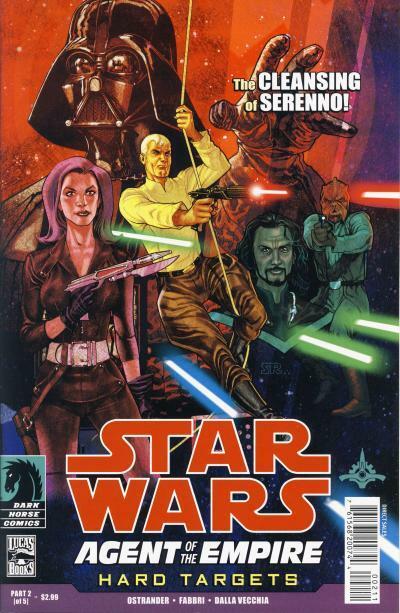 The writer, John Ostrander, does a terrific job juggling the characters and providing cameos for Boba Fett, Bail Organa, Princess Leia, Winter Celchu, Ysanne Isard, and Darth Vader. Unfortunately, this second mini-series is the last story arc for Jahan Cross. Like Darth Maul #1 and 2, Darth Maul #3 is going back to print. The 2nd print is scheduled to be in stores July 5th. This is not actually a comic yet. I ran across the article Help Make Jawa Adventures Comic A Reality! on TheForce.net and I thought I would help out. Otis Frampton, creator of the all age comic Oddly Normal published by Image Comics, wants to draw a title featuring Jawas for Marvel Comics or IDW. In his blog posting "Jawa Adventures" Comic Pitch! he explains why he should be given the job and has many sample drawings showing what such a comic would look like. I looked at the drawings and was immediately sold on the idea! Otis said fans can help by tweeting to Marvel, Star Wars, and Disney feeds (@marvel, @starwars, @disney), and directing them to his pitch. Give it a go. Who knows? We could have a new title on our hands next year! 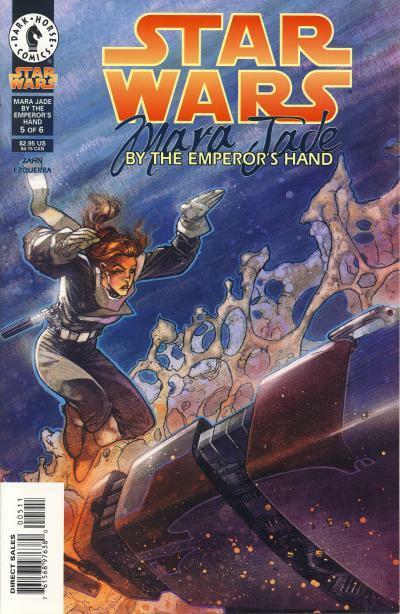 Star Wars #39 is the start of the 6-part The Empire Strikes Back adaptation in the Marvel Star Wars title. The cover artwork is by Al Williamson and Carlos Garzón. It is a terrific cover which focuses on Darth Vader in the foreground and in the background is his Super Star Destroyer, the Executor, flank by standard Star Destroyers to show how massive the ship is. The cover is apropos for the movie title and theme, focusing on the main villain and his command ship he uses to hunt down the heroes. It is unfortunate that the cover is marred by the extra wide yellow Toys R' Us banner at the top and by the large movie logo at the bottom. 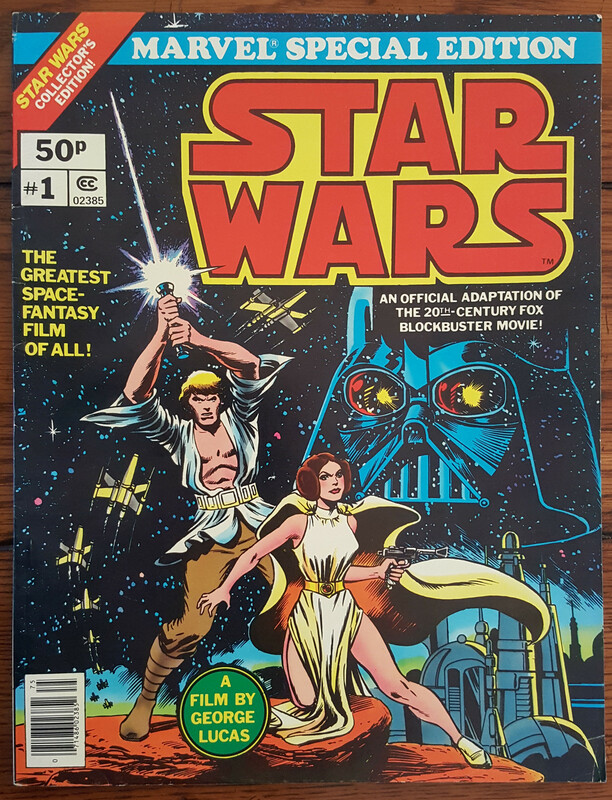 Regardless, this is a classic cover in the truest sense; it is one of the more recognizable vintage Star Wars covers and is used on various merchandise featuring Star Wars comic art. 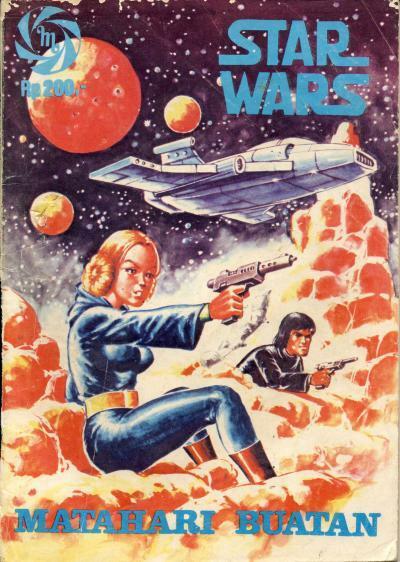 When Dark Horse printed the Archie Goodwin and Al Williamson comic strips in the Classic Star Wars title, not only did Al Williamson provide new artwork for the interior to improve the flow of the story, he also created new covers. Classic Star Wars #3 has a cover that is very similar to Star Wars #39; Darth Vader is again the focus and in the foreground is his command ship, the Executor, this time being constructed at the Shipyards of Fondor. To show the size of the Executor, like on the Marvel cover, a standard Star Destroyer is shown in close proximity. In many ways, the Classic Star Wars #3 cover is an improvement on Star Wars #39 and with the similarity between the two covers, it is hard to imagine Al Williamson didn't have the original in mind. The biggest improvement is how Darth Vader is incorporated into the art. Rather than being solid, Vader is drawn as a ghost-like figure, allowing the details from a busier star field in the background to be seen. Vader is also more dynamic on the cover, still clutching a lightsaber in his right hand, but reach out to the reader with his left hand. Matahari Buatan or Artificial Sun was published in Indonesia by Yayasan Karya Bhakti Bandung. Like many of the other Indonesian Star Wars digests, this comic contains two stories. The lead Star Wars story has amateur artwork that is prevalent in original Indonesian Star Wars stories. Early in the story, Luke Skywalker and Han Solo are both piloting an X-Wing Fighter (there is room for two in the cockpit) and later we see Darth Vader and Princess Leia in the same X-Wing Fighter. Sometime during the story, it looks like Chewbacca rescues Luke and Han. The backup story in this comic is dated 29-4-1975. The cover does not depict a scene from the story inside. It shows Princess Leia and another person (it doesn't look like his outfit but it is most likely Han) aiming their guns at a menace off panel, while an unknown spacecraft flies overhead. I'm really loving these Indonesian Star Wars books. I know many like to describe Marvel's original run as outlandish, but compared to the original Indonesia comics, the Marvel stories are tame. Marvel's output had a consistency that worked very well with what we saw on the movie screen. On the other hand, the Indonesian stories borrow the main characters and throw them into completely alien situations that defy logic, but are cool because of their child-like innocence. The only difference between the U.K. and U.S. version of a Marvel Special Edition Featuring Star Wars treasury is the price on the cover is in pence instead of dollars. It is likely these were printed on the same press as the U.S. editions, like some of the other Marvel pence comics, including Star Wars #2 - 5. It took me a while to add these two issues to my collection because I was holding out for nice copies. They pop up with some regularity on eBay and prices, like their U.S. counterparts, are all over the place.